"Hiking is the best workout." 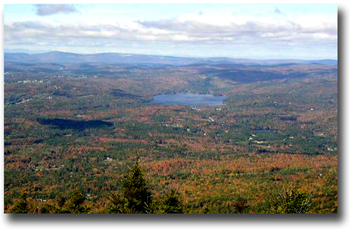 The following hiking trails in New Hampshireare for those that are looking for a different place to climb a mountain but are still a short distance from the Lake Winnipesaukee area. There are still many more trails within the state of New Hampshire for an enjoyable adventure, but these hiking trails are in fairly close proximity to the Lakes Region. This moderate trail starts at an old road and then turns into the woods and goes along stone walls and an old cellar hole. This is a winding trail but delivers some spectacular views of the Franconia and Sandwich range as well as the Baker River Valley of New Hampshire. To get there, take Route 25 West from Plymouth to Rumney. Go North and drive through the village to Stinson Lake. Bear right near the outlet of the lake and drive uphill. Take a sharp left turn to reach the parking lot. This is a moderate hike and the trails on the Canaan side are the easiest way up to the summit. If you take the West Ridge Trail, you'll enjoy the beautiful New Hampshire views once you reach the top. To get there, take Route 4 to Canaan, turn North on Route 118, take a right on the road to Orange. Go over a bridge and take a right at the fork onto Grafton Road. Follow this road for about 1 mile. At the next fork in the road, turn left into Cardigan State Park. This road leads to parking and picnic areas. This is one of the moderate to difficult hiking trails that begins on the Alexandria side of Mount Cardigan and leads to some fantastic New Hampshire views. There is a pond, lodge and camping facilities. In late summer bring a container to pick wild blueberries. To get there, follow Route 3A North out of Bristol. Turn left at blinking light at Newfound Lake onto West Shore Road. Follow West Shore Road for a few miles to the "sign" tree. Go straight. (West Shore turns.) Follow road into Alexandria Village. Take right onto Cardigan Mountain Road for several miles. At intersection on Shem Valley Road, turn into Cardigan Mountain Lodge trail. Enjoy this moderate New Hampshire trail without spending all day on a hike. You still get to enjoy the beautiful scenery, get some exercise and still have time to do something else. To get there, take Route 25 West from the Plymouth traffic circle. At blinking light, turn right into Rumney Village. Take first left onto Buffalo Road. About 2 1/2 miles down the road, you'll find a parking area and a historical marker. This moderate trail provides the best views of the Squam Lakes area of New Hampshire. It's simply gorgeous! To get there, take Route 113 North from Little Squam in Holderness Village. Parking is between Center Sandwich and Holderness, just past Rockywold and Deephaven camps. Look for signs of the "Old Bridle Path" because there is a private trail nearby as well. These New Hampshire hiking trails offer both moderate and difficult terrain. The Sugarloaves Trail begins at the park entrance marked with a sign to the Elwell Trail. Follow this trail up to Little Sugarloaf for some spectacular views. You can turn around at this point and go to the park for a swim or continue on to some more difficult trails by following the yellow markers to reach Big Sugarloaf with even better views of the surrounding area. To get there, take Route 3A from Bristol towards Newfound Lake. Follow signs to Wellington State Park which is on West Shore Road. Parking is just past Wellington State Park and marked as "Elwell Trail" or you can park at the state park for a small fee. Do come early because the park fills up with beachgoers during the summer and parking will be hard to come by. This moderate trail is short and steep with absolutely spectacular views of the countryside all around. This is one of the highest peaks in the southern half of New Hampshire. To get there from the Wilmot side, take Route 11 West towards Andover. Go past Junction of Route 4. About a mile or so, take a left onto Old Winslow Road, which connects to Kearsarge Mountain Road. Follow to the parking area. 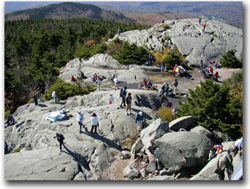 Look elsewhere on this web site for additional New Hampshire hiking trails and hiking tips.